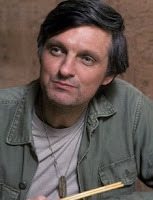 As a child, I grew up watching Alan Alda play the quirkly, and eccentric character of Hawkeye Pierce on the hit TV series M*A*S*H (Mobile Army Surgical Hospital). So I was elated when I read on the USC homepage that he would be chatting with K.C. Cole, who happens to be a science journalist par excellence. I was a bit dismayed when I read that the discussion was scheduled for the afternoon rather than the evening. In any case, Bing Theater was quite full. Apart from talking about his new book ("Things I Overheard While Talking to Myself"), Alan Alda mentioned his fascination for science and how and why one should try to distill complicated scientific ideas and bring them to the general public. He was insightful, witty, articulate and sharp. Both Alan and K.C. emphasized the importance of the confluence of art, science and society. Alan also related quite a few stories from Richard Feynman's life and his experience creating the play "QED". I had the opportunity to talk to him for a brief moment after his book-signing. It was such a delight to hear him talk about how important it is for scientists to show love and passion when they are explaining their ideas in a talk or otherwise. As I heard him I couldn't help but tell myself that this guy really loves science and has a passion and the curiosity to know and understand it. Never be afraid to ask the simple questions, no matter how stupid you may look in someone's eyes. For you never know what kind of floodgates, answers to such questions might open up for you in your mind. The discussion was part of USC's Vision and Voices series which is trying to bring the spirit of Arts and Humanities together. I happened to catch the show "The Universe" on the History channel during the holiday break. About half way into the show the narrator started talking about cosmic wormholes, white-holes and other exotic astrophysics stuff, when lo and behold I saw the familiar face of Clifford Johnson from the USC physics department. I highly encourage reading Cliff's blog "Asymptotia". I watched two episodes of "The Universe" and they were both tastefully done.